Anne Evans, co-founder of ColumbusUnderground.com and TheMetropreneur.com collects Digital Media division first place awards for the local online media outlets, from contest committee member Tony Kozlowski, in the Best Medical/Science Story (Jesse Bethea) and Best Photography (Lillian Dent) categories. 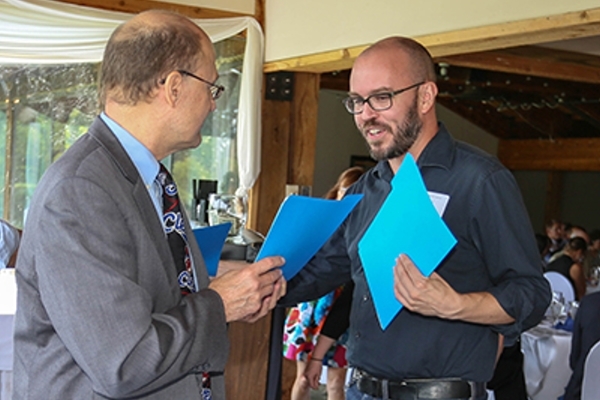 Gary Kiefer, managing editor of new media for The Columbus Dispatch, collects awards for Dispatch staffers at the Ohio SPJ Awards ceremony Aug. 27. Included in The Dispatch's several Best of Show honors was the Ohio’s Best Daily award in the large-circulation Print division. 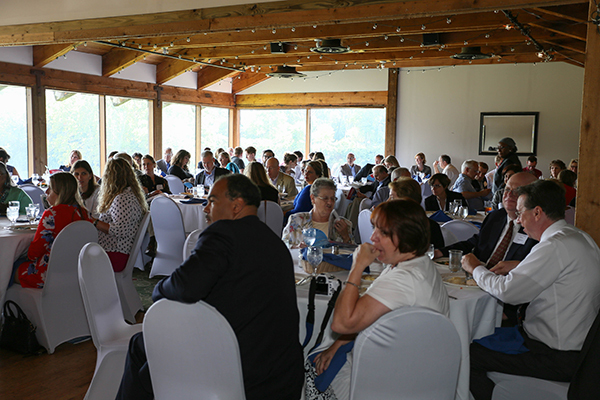 Attendees at the 2016 SPJ Awards banquet Saturday, Aug. 27 await presentation of the Ohio’s Best Journalism honors at Columbus’ Boat House restaurant. 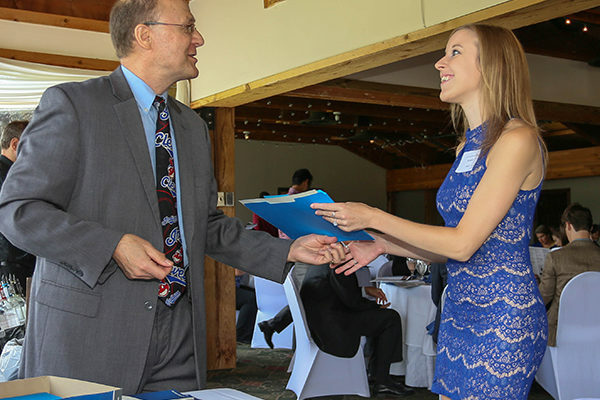 Katy Waters Smith, print editor of Columbus Business First, accepts multiple awards for the publication from Ohio SPJ Advisory Committee member Tony Kozlowski of the Cleveland SPJ. 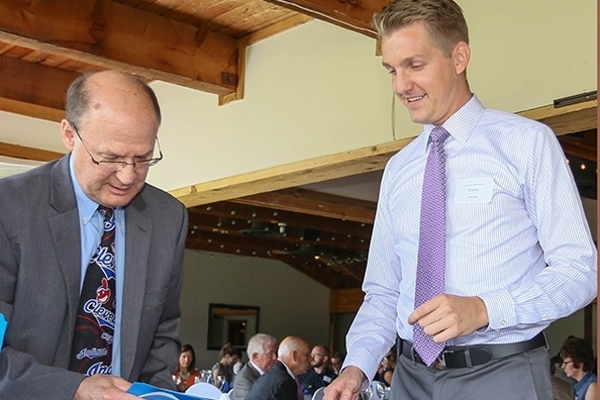 Brooks Jarosz (right), reporter for WSYX ABC 6 TV in Columbus, accepts the first place award in Best Consumer Reporting in the Television division from awards committee member Tony Kozlowski. Jarosz won that award with WSYX colleague Ben Frecker. Jarosz and Frecker also won Television division first place awards for Best Enterprise Reporting and Best Investigative Reporting; Jarosz with Drew Jones of WSYX/WTTE also won second in Best Enterprise Reporting; and Jarosz took second place in Best of Show in the TV division for Best Reporter. 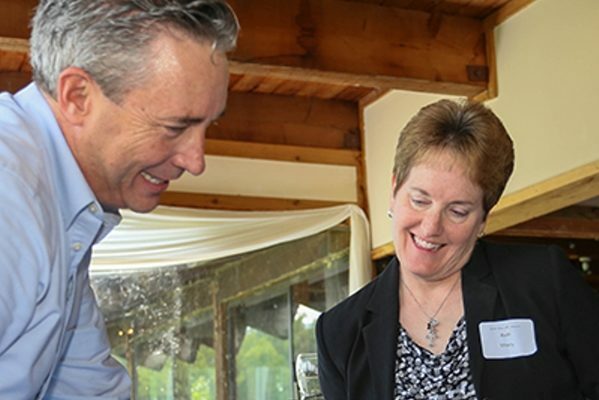 Karen Kassler, board member of the Central Ohio SPJ chapter (left) and Tom Moore, treasurer of the Cleveland SPJ chapter, emceed the 2016 Ohio SPJ Awards banquet Aug. 27 at the Boat House restaurant in Columbus. 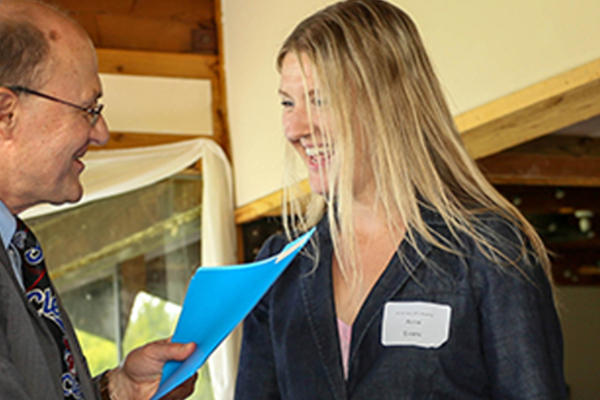 As a contestant in the competition, Kassler won first place in the Radio division for Best Government Reporting for the Statehouse News Bureau’s Ohio Public Radio and Television, and was part of a team at WOSU radio that won first place for Best Spot News. 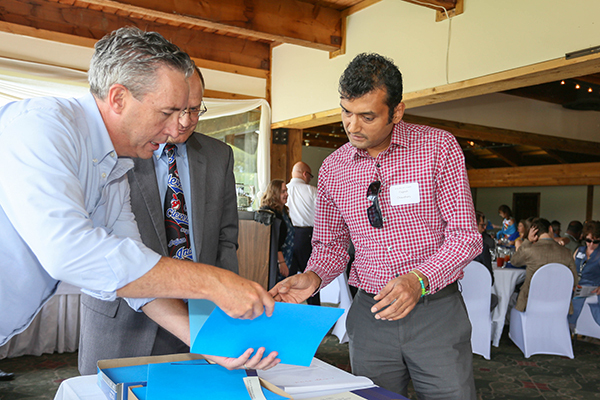 Yogesh Chaudhary, art director of Columbus CEO, accepts the first place award for Best Special Publication for the magazine, in the Print under 75,000 circulation division, from contest committee member Joe Meyer. Walker Evans, co-founder of ColumbusUnderground.com and TheMetropreneur.com, collects the second place Digital Media award for Specialized Journalism Site for TheMetropreneur.com, from contest committee member Joe Meyer. Evans also picked up the Digital Best in Show award for Best General News Site for ColumbusUnderground.com. 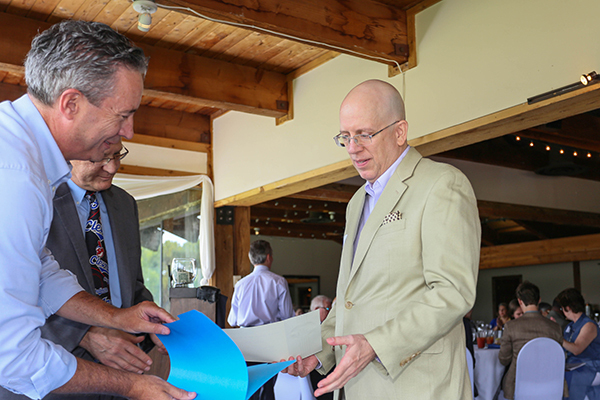 Brad Keefe (right), of Columbus Alive, accepts the first place award for Best Arts Reporting, in the Print under 75,000 circulation division, from awards program committee member Tony Kozlowski at the Ohio SPJ Awards luncheon Aug. 27. Jeff Regensburger of ColumbusUnderground.com collects the first place Digital division award for Best Arts/Entertainment story, from awards program committee member Tony Kozlowski. Susan Post is congratulated by contest committee member Joe Meyer for her second place award in the Digital Media division Best Business/Tech Story category, for her story on Columbus crowdfunding campaigns published on TheMetropreneur.com. Tara Weingartner (center) collects three Radio division awards for WVXU in Cincinnati, including her own first place awards for Best Enterprise Reporting and Best Feature Reporting, as Debbie Holmes of WOSU in Columbus (right) waits to pick up her first place Radio division award for Best Consumer Reporting. In the Digital division, Weingartner also won first place awards for Best Headline Writing and Best Sports Coverage. 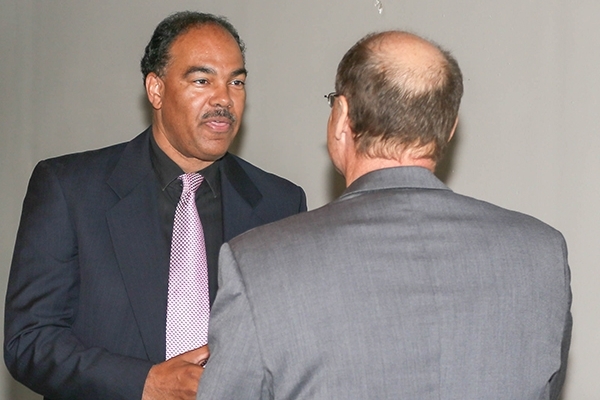 Rick Jackson of WVIZ/PBS Ideastream in Cleveland, collects an award for the station from award committee member Tony Kozlowski. In the Television division, Jackson also won two Best in Show awards -- for Best Anchor and, with Amy Cummings, Best Public Affairs Program. 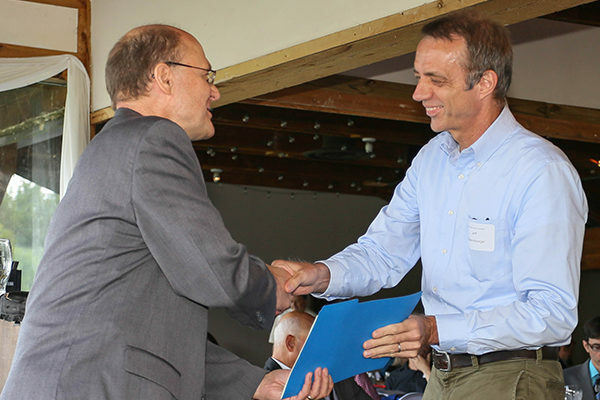 Barrie Barber of the Dayton Daily News (right) accepts his first and second place awards for Best Medical/Science Reporting, large circulation division, from contest committee member Joe Meyer. The skyline of Downtown Columbus is visible from the banquet room of The Boat House at Confluence Park, which hosted the 2016 SPJ Awards/Ohio’s Best Journalism luncheon Saturday, Aug. 27. Beth Mlady of cleveland.com collects her five awards in the Freelance Print division: first and second place in Best News Writing; first and second place in Best Feature Writing; and first place in Best Government Reporting, from Ohio SPJ Awards committee member Joe Meyer. 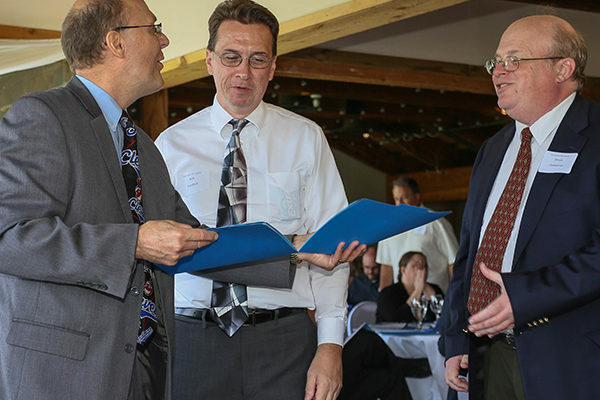 Ohio SPJ Awards contest ceremony producer Tony Kozlowski (left) distributes the first and second place awards in the Digital Media division Best News Reporting category to, respectively, Bruce Geiselman of cleveland.com (right) and Bob Sandrick of Advance Ohio (center). 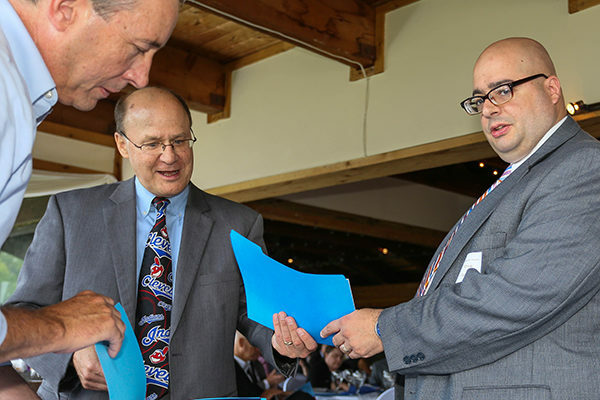 Vince Guerrieri (right), web editor at the Elyria Chronicle-Telegram, collects Digital Media division awards for chronicle.northcoastnow.com, from contest committee members Joe Meyer and Tony Kozlowski. Guerrieri also won the Best of Show first place award for Best Freelance Writer in the Freelance Print division. 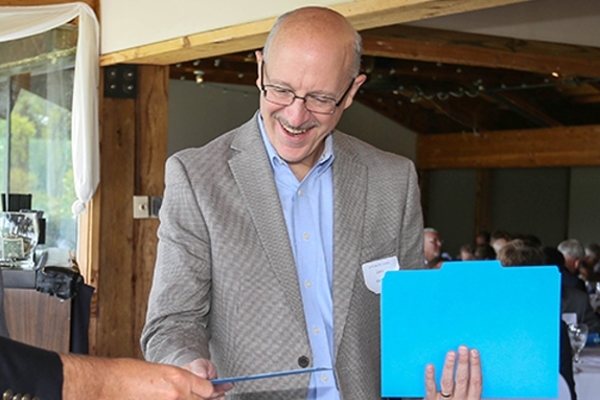 Barrett Brunsman of the Cincinnati Business Courier (right), collects his first place award for Best Medical/Science Reporting, Print under 75.000 circulation division, from contest committee member Joe Meyer. The Cincinnati Business Courier also was honored with the Best of Show Print award for Best Weekly Newspaper in Ohio. 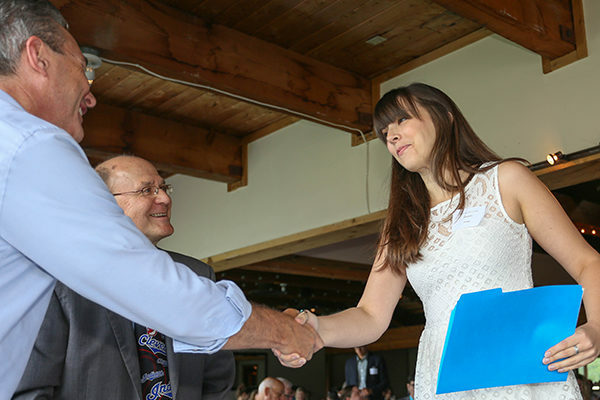 Kristen Mott, honored as the Best Reporter in Ohio for Print publications with circulation under 75,000, collects an award for her employer, The Cleveland Jewish News, from contest committee member Tony Koslowski. 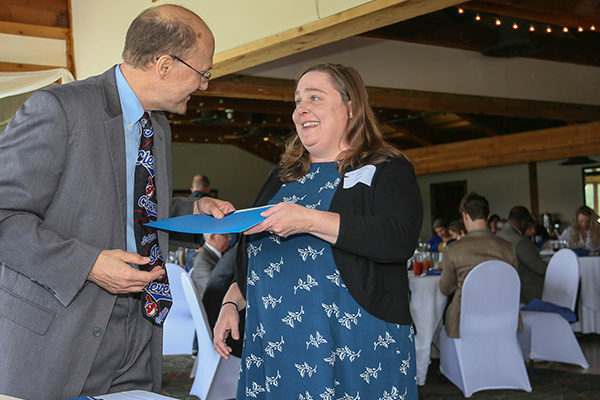 Kim Hone McMahon of the Akron Beacon-Journal collects her first place award for Best Feature Reporting, along with several other awards for the Beacon-Journal, from Ohio SPJ Awards Advisory Committee member Joe Meyer of the Central Ohio SPJ Aug. 27. 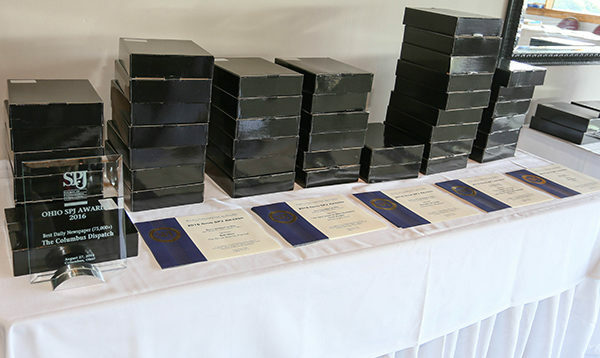 2016 Best of Show awards await distribution before the ceremony i n Columbus Saturday, Aug. 27. At left is the crystal plaque for The Columbus Dispatch, named Ohio’s Best Daily in the contest’s large-circulation Print division. 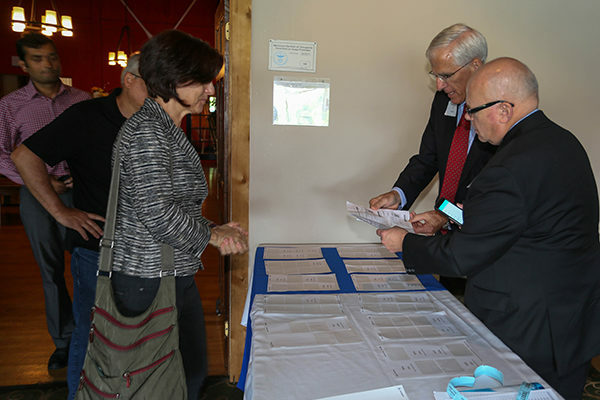 At right, Ohio SPJ Awards Advisory Committee members Tom McKee (top) and Tom Moore welcome guests at the registration desk Aug. 27 to the 2016 awards banquet Aug. 27. McKee is president of the Cincinnati SPJ chapter and Moore is treasurer of the Cleveland SPJ chapter. As a contestant in the competition, McKee, with WCPO-TV in Cincinnati, was honored with three first place awards in Television division: Best General Assignment Reporting, Best Government Reporting and Best Sports Reporting. Tony Kozlowski, SPJ Awards ceremony producer and board member of the Cleveland SPJ chapter (left) greets a group of award winners from Miami University. The Miami Student won first place for Best College Non-Daily Newspaper and first place for Best College News Writing. 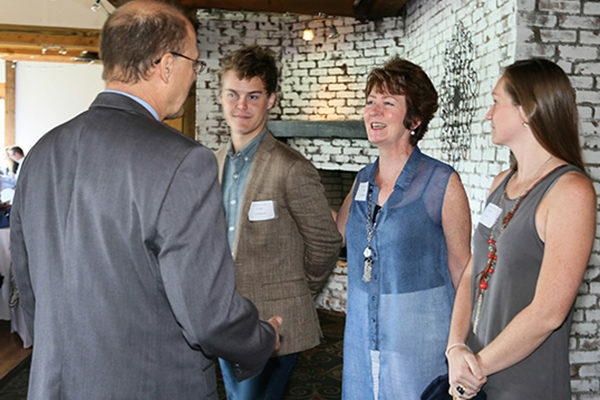 On hand to collect the awards in Columbus Aug. 27 are (from left) current Student Editor in Chief James Steinbauer, faculty adviser Patti Gallagher Newberry and former Student Managing Editor Emily Tate. 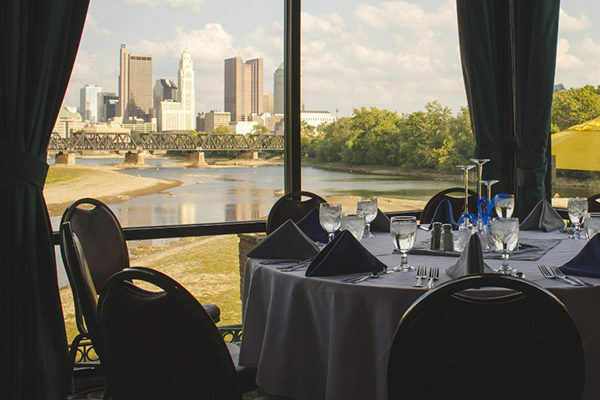 Early arriving guests at the 2016 Ohio SPJ Awards banquet settle down to tables Saturday, Aug. 27, at the Boat House restaurant at Confluence Park, 679 W. Spring St., Columbus. 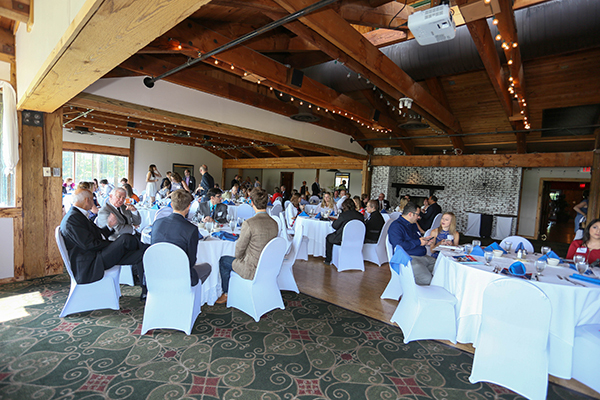 Nearly 100 of Ohio’s top journalists attended the 2016 SPJ Awards/Ohio’s Best Journalism luncheon Saturday, Aug. 27 at The Boat House restaurant in Columbus. 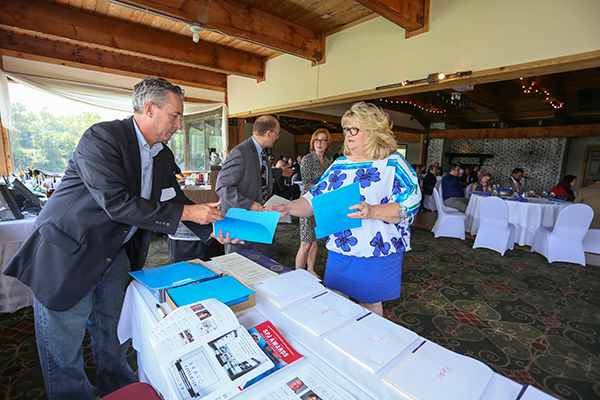 The Ohio’s Best Journalism contest is staged annually by the state’s three Society of Professional Journalists chapters — of Central Ohio, Cincinnati and Cleveland. 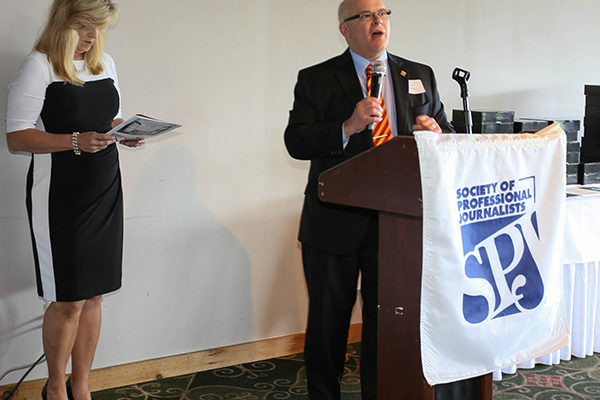 The SPJ Awards banquet rotates among the three cities, with Columbus hosting this year’s event and Cleveland set to host in 2017. A total of 652 entries were submitted in the 20th annual staging of the contest. Top work for the 2015 calendar year was recognized in several divisions: College, Digital Media, Print (more than 75,000 circulation and less than 75,000 circulation classes) Freelance Print, Freelance Digital, Radio, Television, and Trade Publications. Additional Digital and Freelance categories were added this year to reflect the changing journalism profession. 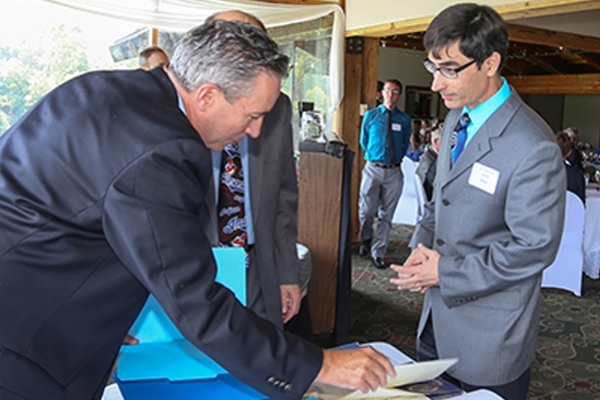 A total 312 winners were chosen across all divisions and categories. 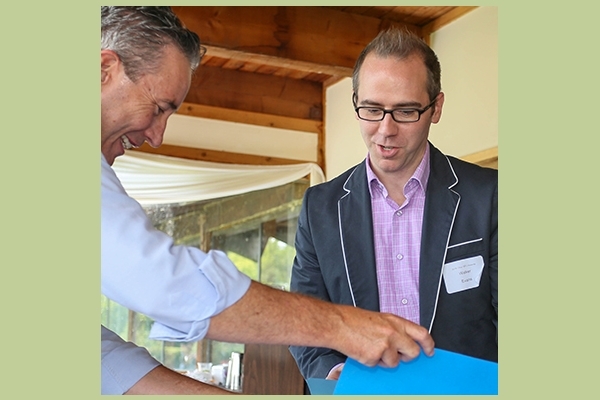 Special thanks to this year’s contest judges, members of the Long Island Press Club. From the Central Ohio SPJ Board of Directors, congratulations to all the 2016 winners! 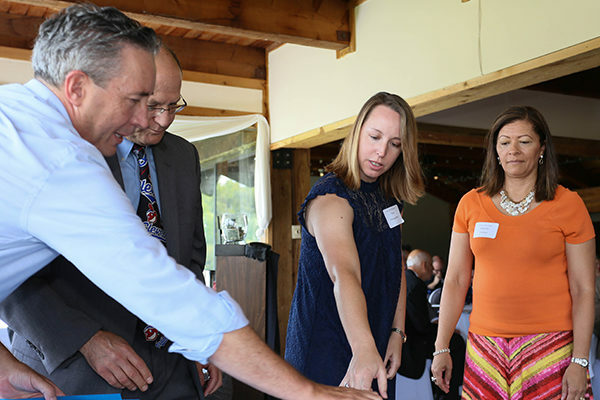 We hope you enjoy this slideshow of images from the awards banquet, Check out the full winners list at OhioSPJAwards.org.